Every year, Business Talent Group reviews the trends that are shaping the independent consulting economy to help F1000 executives understand the power of on-demand talent—and what it can help them accomplish. 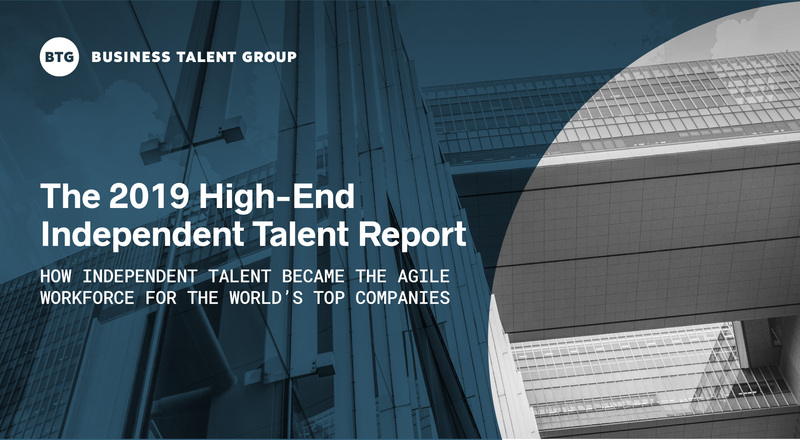 This year’s results are summarized in our 2019 High-End Independent Talent Report. So how are F1000 companies leveraging independent consultants, experts, and executives? What emerges from the data is a vivid picture of cutting-edge skills and initiatives, from market analysis to product strategy. Like last year, the greatest needs were for project leadership in highly specialized niches like supply chain, disruptive innovation, and market access. Given the dismally low completion rate of most corporate projects, it suggests savvy companies have realized that freelance project management consultants can provide critical support in situations where resources are tight or teams are distracted by competing priorities. But given that 83% of companies report skills gaps that threaten their organization’s ability to prepare for the future, it’s also no surprise that the needs went beyond project management. So what other critical projects are independent consultants working on? Indeed, independent “gig economy” workers have emerged as a powerful solution to the talent gaps many companies are facing. Nearly one-third of global workers are free agents, and 80% of global CHROs predict that their deployment of these nontraditional workers will increase in the coming years. Scarcity is by far the biggest pain point. BTG’s research is based on an analysis of 12 months of client needs, with the goal of understanding how these professionals are helping large companies get work done. “In a tight labor market, companies turn to independent professionals for cutting-edge skills that often can’t be found anywhere else. We are thrilled to help executives understand the breadth of what these professionals can accomplish—and the many ways they can make a difference on mission-critical initiatives,” Jody Greenstone Miller, Business Talent Group’s CEO and co-founder, commented. To see trends and sample projects across all industries and by business function, read the report. How did freelance consultants helped other F1000 executives? Read our 2019 report to find out.